I have long wanted to do a little work to debunk the endlessly repeated myth that the Hinnom Valley (Gehenna) was a perpetually burning trash dump. There simply is no evidence to support the idea, but because it seems a reasonable explanation for the origin of the Hinnom Valley as “hell,” writers and preachers accept and propagate the story. [Kimchi] maintained that in this loathsome valley fires were kept burning perpetually to consume the filth and cadavers thrown into it. However, Strack and Billerbeck state that there is neither archeological nor literary evidence in support of this claim, in either the earlier intertestamental or the later rabbinic sources. Jeremiah 7:31–32 (ESV) — And they have built the high places of Topheth, which is in the Valley of the Son of Hinnom, to burn their sons and their daughters in the fire, which I did not command, nor did it come into my mind. Therefore, behold, the days are coming, declares the Lord, when it will no more be called Topheth, or the Valley of the Son of Hinnom, but the Valley of Slaughter; for they will bury in Topheth, because there is no room elsewhere. Isaiah had already envisioned Topheth as the fiery destiny of an enemy of God. Isaiah 30:33 (HCSB) — Indeed! Topheth has been ready for the king for a long time now. His funeral pyre is deep and wide, with plenty of fire and wood. The breath of the Lord, like a torrent of brimstone, kindles it. 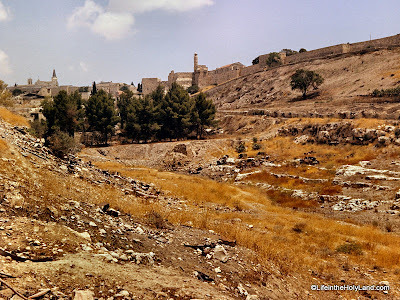 It is not difficult to see, from these and other texts (e.g., 2 Kgs 23:10; 2 Chr 28:3, 33:6; Jer 32:35), why Jesus and his contemporaries used the word Gehenna (“valley of Hinnom”) as synonymous with the place of everlasting fiery torment. Indeed, there is no reason to search further for ancient burning piles of discarded newspapers, product packaging, and junk mail. “In these gardens, lying partly within the mouth of Hinnom and partly in the Valley of Jehoshaphat, and irrigated by the waters of Siloam, Jerome assigns the place of Tophet; where the Jews practised the horrid rites of Baal and Moloch, and ‘burned their sons and their daughters in the fire.’ It was probably in allusion to this detested and abominable fire, that the later Jews applied the name of this valley (Gehenna), to denote the place of future punishment or the fires of hell. At least there is no evidence of any other fires having been kept up in the valley; as has sometimes been supposed” (Biblical Researches, vol. 1 , 404-5). The origin of the “garbage dump” theory appears to be Kimchi. James A. Montgomery observes this medieval commentator’s logic, but does not accept it. “With the common sense which often characterizes Jewish commentators, Kimchi says that the place was the dump of the city, where fires were always kept burning to destroy the refuse; ‘therefore the judgment of the wicked is parabolically called Gehenna.’ But from the Biblical references the place appears to have nothing physically objectionable about it; in contrast to its contemporary condition Jeremiah prophesied that it would one day be called ‘Valley of Slaughter’” (“The Holy City and Gehenna,” JBL 27/1 , 34). “Kimhi's otherwise plausible suggestion, however, finds no support in literary sources or archaeological data from the intertestamental or rabbinic periods. There is no evidence that the valley was, in fact, a garbage dump, and thus his explanation is insufficient” (“Gehenna: The Topography of Hell,” Biblical Archaeologist 49/3 , 188-89). “The notion, still referred to by some commentators, that the city’s rubbish was burned in this valley, has no further basis than a statement by the Jewish scholar Kimchi made about A.D. 1200; it is not attested in any ancient source. The valley was the scene of human sacrifices, burned in the worship of Moloch (2 Kings 16:3 and 21:6), which accounts for the prophecy of Jeremiah that it would be called the Valley of Slaughter under judgment of God (Jer. 7:32-33). This combination of abominable fires and divine judgment led to the association of the valley with a place of perpetual judgment (see Isa. 66:24) and later with a place of judgment by fire without any special connection to Jerusalem (see, for example, 1 Enoch 27:1ff., 54:1ff., 63:3-4, and 90:26ff)” (Jesus and the Kingdom of God, 376-77). W. D. Davies and D. C. Allison, in their excellent commentary on Matthew, note the lack of ancient evidence but do not entirely reject the notion of a garbage dump. “Why the place of torment came to have this name, the name of the valley south of Jerusalem, gê-hinnōm (Josh 18.16 LXX: Γαιεννα), now Wādier-rabābi, is uncertain. The standard view, namely, that the valley was where the city’s garbage was incinerated and that the constantly rising smoke and smell of corruption conjured up the fiery torments of the damned, is without ancient support, although it could be correct. Perhaps the abode of the wicked dead gained its name because children had there been sacrificed in fire to the god Molech (2 Chr 28.3; 33.6), or because Jeremiah, recalling its defilement by Josiah (2 Kgs 23.10; cr. 21.6), thundered against the place (Jer 7.31-2; 19.2-9; 32.35), or because it was believed that in the valley was the entrance to the underworld home of the pagan chthonian deities (cf. b. ‘Erub. 19a) (Matthew 1-7, 514-15). In the “Gehenna” article in the recent (2007) New Interpreter’s Dictionary of the Bible, Philip S. Johnston considers the biblical evidence to provide “perhaps sufficient links” though he does not dismiss outright the dump theory. “The exact process by which a geographical toponym became the locale of postmortem punishment is obscure. The clear association with abhorrent sacrifice and subsequent slaughter, and the possible further links with fire and corpses are perhaps sufficient links. It is often suggested that the Hinnom Valley became Jerusalem’s garbage dump, and that it constantly smoldered. Alternatively, the association to the cult of the underworld deity Molech seems to contain a link between a fiery altar and the entrance to divine realm” (2:531). Bailey gives a further suggestion that may help to explain the origin of the view of Gehenna. The practice of sacrifice to foreign gods led to the view expressed in the Talmud that the Hinnom Valley was the location of two of the gates to Gehenna. (Rabbi Jeremiah ben Eleazar further stated:) Gehenna has three gates; one in the wilderness, one in the sea and one in Jerusalem. (According to Rabbi Johanan ben Zakkai's school:) There are two palm trees in the Valley of Ben Hinnom and between them smoke arises..,. and this is the gate of Gehenna? (Babylonian Talmud, Erubin, 19a-see Slotki 1938: 130-31)” (191). Finally, Ronny Reich and Eli Shukron conclude their article on a New Testament-period dump in Jerusalem with some observations from archaeological investigation about the location of the Old Testament-period dump in the Kidron Valley. “It seems that the location of the city-dump of the late Second Temple period in this particular part of the city had a previous long history in the late Iron Age II. The Book of Nehemiah mentions several times a gate called Saar ha-Aspot/Sopot (Neh 2, 13; 3:13-14; 12:31). This toponym is usually translated as ‘Dung Gate’, based on the analogy with 2 Sam 2,8 and Ps 113,7 (Simons 1952, 123). These verses mention the city’s poor people, who most probably were foraging the city dump for food. Even if we accept B. Mazar’s suggestion (1975, 194-95), to relate spt to tpt – the Tophet – which was an extramural high place in the Valley of Hinnom (2 Kgs 21, 6; 2 Chr 33,6), we remain in an area of dirt. This place involved an extensive use of fire, which produced burning waste such as ashes, soot and charred wood. Also the location of the Gate of the pottery sherds (Sa’ar ha-Harsit), in the south (Jer 19,2), might point to a pile of garbage (Simons 1952, 230), as pottery vessels were the type of household item broken and discarded in antiquity more than any other type of artifact. All the various types of city-garbage (ashes, pottery shards, waste of human occupation, etc.) were moved and dumped at the southeastern side of the city of Jerusalem, in the Iron Age and Persian periods. This was the city dump to where also the debris of the smashed cult objects and related material that was created during the Josianic religious reform, were moved and dumped, mentioning particularly the Kidron Valley (2 Kgs 23,4,6,10,12)” (“The Jerusalem City-Dump in the Late Second Temple Period, Israel Exploration Journal 53 , 17). The “southeastern side” of Jerusalem is the southern portion of the Kidron Valley, and this was the area of the excavators’ study. The “extensive use of fire” is in relation to the activities of a high place, whereas the waste products of the city inhabitants were not of the sort that required significant burning. In short, while it may not be denied that there was some burning of garbage in ancient Jerusalem, there is no indication that this was extensive, that it was located in the Hinnom Valley, or that it was in any way connected to the fires of eternal torment. A simpler and better supported explanation is the sacrificial offerings to pagan deities in the Hinnom Valley (Jer 7:31-32; 32:35; 2 Kgs 23:10; 2 Chr 28:3; 33:6).